On the hunt for a few growth stocks that hold massive upside potential? Consider giving these three gems a closer look. Alibaba Group Holding Ltd (NYSE:BABA) got off to a rough start as a public entity, but has since come roaring back to life. Investors who bought at the IPO and held until today have enjoyed a market-thumping gain of more than 50%. Of course, Alibaba's future returns might be more muted now that the company's market cap exceeds $350 billion. Knowing that, we asked a team of investors to highlight a stock that holds more upside potential that Alibaba. Here's why they selected Tucows (NASDAQ:TCX), TripAdvisor (NASDAQ:TRIP), and BofI Holdings (NYSE:AX). Rich Duprey (Tucows): "Do one thing and do it well" is not a philosophy Tucows subscribes to any longer. The company has branched out from its original domain registration business to also encompass low-cost mobile services and high-speed fiber internet access. While some businesses are smaller than others -- the domain name business accounts for 61% of total revenues -- all of them are doing well. The domain business is Tucows' cash cow, and it's using the profits generated from it to finance the growth of its other two segments. Tucows is the second largest domain registry behind GoDaddy (NYSE:GDDY), and makes most of its money from domain resellers who provide it with a large, recurring stream of revenues. It's not a high-growth business, but it does reliably produce a lot of cash, having generated 14 straight years of positive operating cash flows. It is using that money to build up its other streams, which should become its main vehicles of growth in the future. Meanwhile, Tucows Ting Mobile offers deeply discounted services that are resonating with customers. Subscribers have grown from 94,000 at the end of 2014 to 151,000 at the end of last year, and by the end of the first quarter Tucows had added an additional 24,000 subscribers to the rolls. Its high-speed Ting Fiber service is still in the early stages of growth -- after an acquisition in February, it has begun offering services in a handful of U.S. cities -- but it is rolling it out to more areas this year. Like Ting Mobile, it offers an attractive discounted pricing policy with no long-term contracts to get locked into. That ought to make it a better choice than its bigger, better-financed rivals, and when taken together with its other services, makes Tucows a stock that could see fantastic growth beyond the phenomenal gains it's already registered. Demitri Kalogeropoulos (TripAdvisor): Like Alibaba, TripAdvisor owns an incredibly popular e-commerce platform. It logged just under 400 million monthly visitors across its portfolio of travel-booking sites and apps last quarter as other key engagement metrics, including review volume and hotel listings, hit new highs. Yet TripAdvisor shares have been pummeled in the wake of an operating shift that recently stopped growth in its tracks. Revenue ticked lower in 2016, and earnings slumped after the company switched to a direct hotel booking model, which management believes will ultimately deliver better long-term growth based on an improved shopping experience for its travel fans. Investors who agree with that prediction found encouragement in the company's return to growth in hotel click-based transaction revenue last quarter, even if the stock price remained depressed due to underwhelming profit trends. Sure, it's possible that the costly investments TripAdvisor has made in its platform won't pay off to the degree that management had hoped. However, if the company does succeed at better translating its hefty engagement numbers into increased spending, there's a huge runway for growth ahead. Its $1.5 billion of sales last year represented just a tiny fraction of a $567 billion global travel market that's rapidly shifting toward the type of mobile-focused, content rich, do-it-yourself shopping experience that TripAdvisor is delivering to its users. 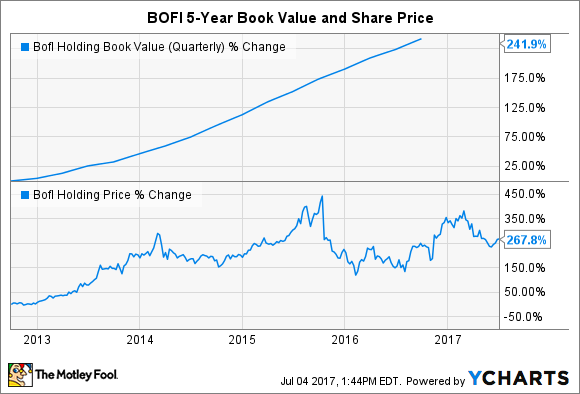 Brian Feroldi (BofI Holding): One way to identify a stock that holds massive upside potential is to look for a small-cap company that has an innovative business model in a massive industry. I think that BofI Holding is a company that fits this criteria perfectly, which is why I think that it could be a terrific stock growth investors to buy today. "BofI" stands for Bank of Internet, so you'd be correct to assume this company operates in the banking sector. Just like other banks, BofI makes its money by taking in deposits and making loans. However, what makes BofI unique is that it does not operate any physical branches. Instead, the company interacts with its customers online and over the phone, which helps to keep its operating costs low. So low, in fact, that it boasts an efficiency ratio that is far better than that of the best big banks in the country. Since BofI's costs are lower, the company can offer its customers very attractive rates and still earn a healthy profit. I personally took advantage of the company's low rates last year when I refinanced my home mortgage. While shopping around I found that choosing BofI as my mortgage provider would save me a few thousand dollars in closing costs when compared to competitors. I ended up choosing it, and have been a happy customer for nearly a year now. Given BofI's ability to offer extremely competitive rates, perhaps it isn't hard to understand why the company has grown like a weed over the last few years. In turn, its stock has been a home run for investors. While BofI's history is impressive, the company is still just a small fry in the world of banking. As of the end of March, it only held about $8.7 billion in total assets on its books. By contrast, Bank of America currently holds more than $2.2 trillion in total assets. These figures suggest that there is still ample room for BofI to grow in the years ahead.